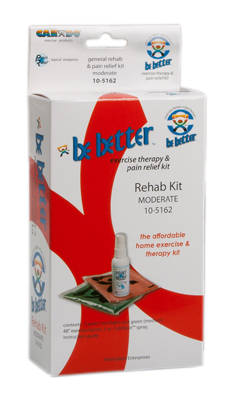 Be Better® shoulder rehabilitation kit is perfect for home exercise programs and individual patient use. Be Better® kit combines CanDo® exercise products to increase strength, and ColdSpot™ pain relieving spray to increase comfort, along with an illustrated instruction pamphlet. Kit includes yellow x-light strength 4-foot length of low-powder exercise band. CanDo® high quality latex resistive exercise band has been used in clinics for rehabilitation, conditioning and training since 1984. It has become a well known staple of many physical therapy programs. CanDo® exercise band is an economic solution for upper and lower body exercise. Lightweight, compact and portable. Durable. Effective when used alone, or with handles and anchors. CanDo® low powder exercise band is made of natural rubber latex, which may cause allergic reactions. For those with latex sensitivities, there are latex-free alternative offerings of CanDo® exercise band. Kit also includes CanDo® shoulder pulley to increase shoulder range of motion. The shoulder pulley secures to the top of a door. Kit also includes 2 ounce spray bottle of ColdSpot™ topical analgesic spray. 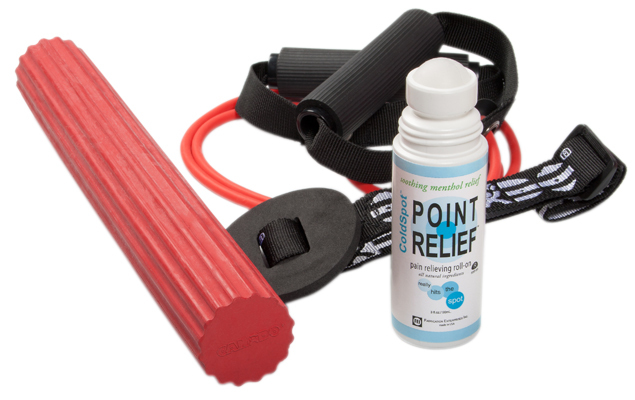 Point Relief® ColdSpot® topical analgesic spray offers fast-acting, soothing, temporary relief of minor aches and pains of muscles and joints associated with simple backache, arthritis, bruises, strains and sprains. Water-based formula minimizes grease and residue. All natural ingredients including menthol, MSM, ilex, and arnica. Has refreshing Peppermint scent. Dimensions: 6" x 2" x 5.5"
Be Better® general light-level rehabilitation kit is perfect for home exercise programs and individual patient use. 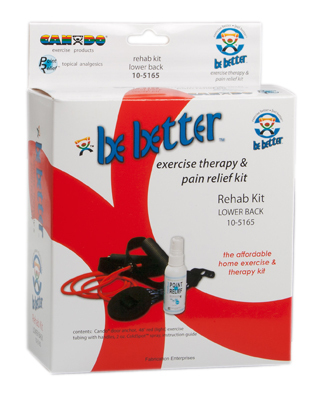 Be Better® kit combines CanDo® exercise products to increase strength, and ColdSpot™ pain relieving spray to increase comfort, along with an illustrated instruction pamphlet. Kit includes yellow x-light strength and red light strengths of 4-foot length of low-powder exercise band. CanDo® high quality latex resistive exercise band has been used in clinics for rehabilitation, conditioning and training since 1984. It has become a well known staple of many physical therapy programs. CanDo® exercise band is an economic solution for upper and lower body exercise. Lightweight, compact and portable. Durable. Effective when used alone, or with handles and anchors. CanDo® low powder exercise band is made of natural rubber latex, which may cause allergic reactions. For those with latex sensitivities, there are latex-free alternative offerings of CanDo® exercise band. Kit also includes 2 ounce spray bottle of ColdSpot™ topical analgesic spray. 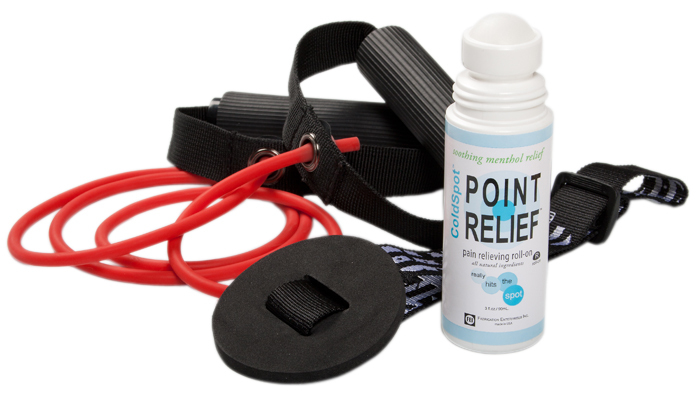 Point Relief® ColdSpot® topical analgesic spray offers fast-acting, soothing, temporary relief of minor aches and pains of muscles and joints associated with simple backache, arthritis, bruises, strains and sprains. Water-based formula minimizes grease and residue. All natural ingredients including menthol, MSM, ilex, and arnica. Has refreshing Peppermint scent. Dimensions: 6" x 1.75" x 3.5"
Be Better® general moderate-level rehabilitation kit is perfect for home exercise programs and individual patient use. 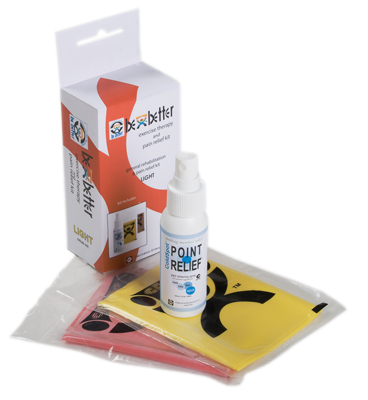 Be Better® kit combines CanDo® exercise products to increase strength, and ColdSpot™ pain relieving spray to increase comfort, along with an illustrated instruction pamphlet. Kit includes red light and green moderate strengths of 4-foot length of low-powder exercise band. CanDo® high quality latex resistive exercise band has been used in clinics for rehabilitation, conditioning and training since 1984. It has become a well known staple of many physical therapy programs. CanDo® exercise band is an economic solution for upper and lower body exercise. Lightweight, compact and portable. Durable. Effective when used alone, or with handles and anchors. CanDo® low powder exercise band is made of natural rubber latex, which may cause allergic reactions. For those with latex sensitivities, there are latex-free alternative offerings of CanDo® exercise band. 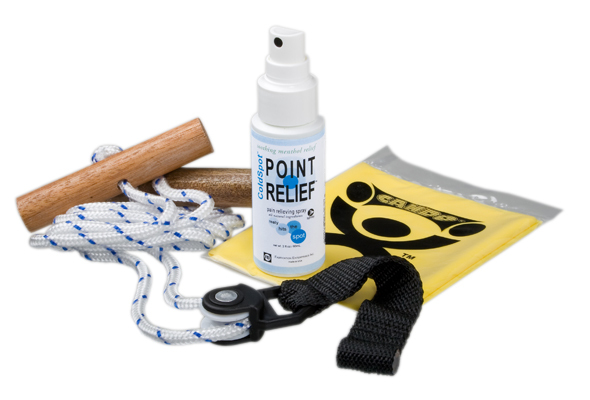 Kit also includes 2 ounce spray bottle of ColdSpot™ topical analgesic spray. 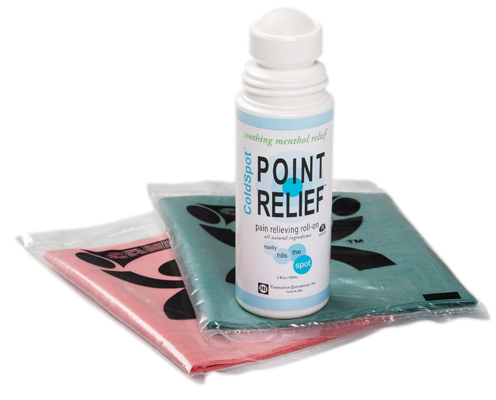 Point Relief® ColdSpot® topical analgesic spray offers fast-acting, soothing, temporary relief of minor aches and pains of muscles and joints associated with simple backache, arthritis, bruises, strains and sprains. Water-based formula minimizes grease and residue. All natural ingredients including menthol, MSM, ilex, and arnica. Has refreshing Peppermint scent. 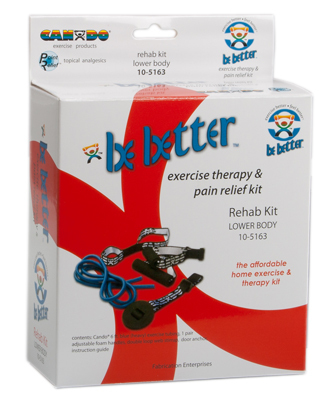 Be Better® lower body rehabilitation kit is perfect for home exercise programs and individual patient use. Be Better® kit combines CanDo® exercise products to increase strength along with an illustrated instruction pamphlet. 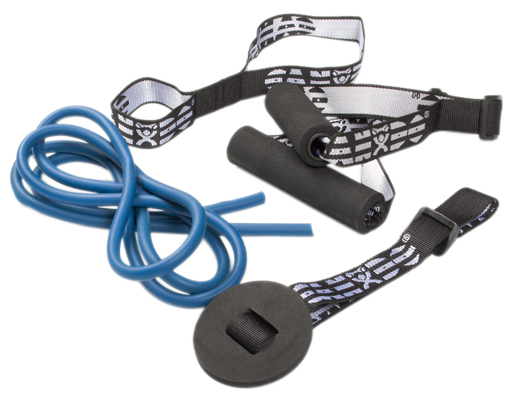 Kit includes 5-foot length of blue heavy low-powder exercise tubing. CanDo® high quality latex resistive exercise tubing has been used in clinics for rehabilitation, conditioning and training since 1984. It has become a well known staple of many physical therapy programs. CanDo® exercise band is an economic solution for upper and lower body exercise. Lightweight, compact and portable. Durable. Effective when used alone, or with handles and anchors. CanDo® low powder exercise tubing is made of natural rubber latex, which may cause allergic reactions. For those with latex sensitivities, there are latex-free alternative offerings of CanDo® exercise band. Kit also includes a loop stirrup, door anchor and 1 pair of adjustable foam handles. These accessories enable exercise tubing to be used to perform various exercises described in the pamphlet. Dimensions: 6" x 2.5" x 5.5"
Be Better® lower back rehabilitation kit is perfect for home exercise programs and individual patient use. Be Better® kit combines CanDo® exercise products to increase strength, and ColdSpot™ pain relieving spray to increase comfort, along with an illustrated instruction pamphlet. Kit includes red light strength 4-foot CanDo® tubing with handles exerciser. CanDo® high quality latex resistive exercise tubing has been used in clinics for rehabilitation, conditioning and training since 1984. It has become a well known staple of many physical therapy programs. CanDo® exercise tubing is an economic solution for upper and lower body exercise. Lightweight, compact and portable. Durable. Effective when used alone, or with handles and anchors. CanDo® low powder exercise tubing is made of natural rubber latex, which may cause allergic reactions. For those with latex sensitivities, there are latex-free alternative offerings of CanDo® exercise band. Kit also includes door anchor accessory to facilitate exercise described in the pamphlet. Kit also includes 2 ounce spray bottle of ColdSpot™ topical analgesic spray. 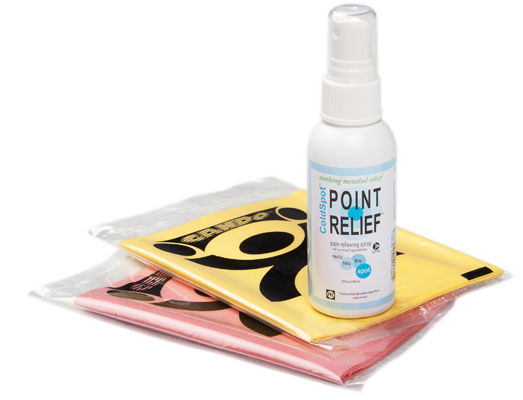 Point Relief® ColdSpot® topical analgesic spray offers fast-acting, soothing, temporary relief of minor aches and pains of muscles and joints associated with simple backache, arthritis, bruises, strains and sprains. Water-based formula minimizes grease and residue. All natural ingredients including menthol, MSM, ilex, and arnica. Has refreshing Peppermint scent. Be Better® shoulder rehabilitation kit is perfect for home exercise programs and individual patient use. 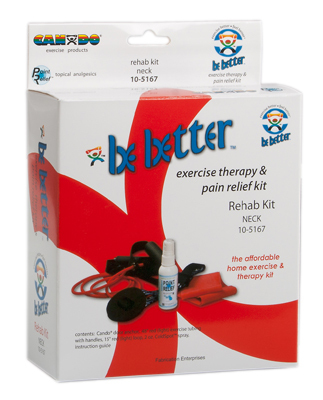 Be Better® kit combines CanDo® exercise products to increase strength, and ColdSpot™ pain relieving roll-on to increase comfort, along with an illustrated instruction pamphlet. Kit includes red light strength 4-foot CanDo® tubing with handles exerciser. CanDo® high quality latex resistive exercise tubing has been used in clinics for rehabilitation, conditioning and training since 1984. It has become a well known staple of many physical therapy programs. CanDo® exercise tubing is an economic solution for upper and lower body exercise. Lightweight, compact and portable. Durable. Effective when used alone, or with handles and anchors. CanDo® low powder exercise tubing is made of natural rubber latex, which may cause allergic reactions. For those with latex sensitivities, there are latex-free alternative offerings of CanDo® exercise band. Kit also includes door anchor accessory to facilitate exercise described in the pamphlet. Kit also includes 3 ounce roll-on bottle of ColdSpot™ topical analgesic lotion. Point Relief® ColdSpot® topical analgesic roll-on offers fast-acting, soothing, temporary relief of minor aches and pains of muscles and joints associated with simple backache, arthritis, bruises, strains and sprains. Water-based formula minimizes grease and residue. All natural ingredients including menthol, MSM, ilex, and arnica. Has refreshing Peppermint scent. 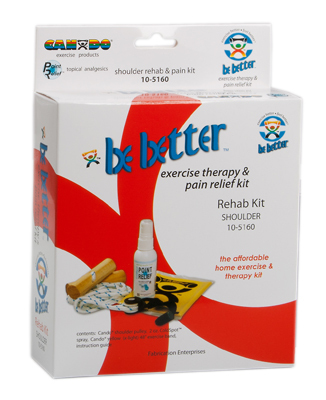 Be Better® cervical rehabilitation kit is perfect for home exercise programs and individual patient use. 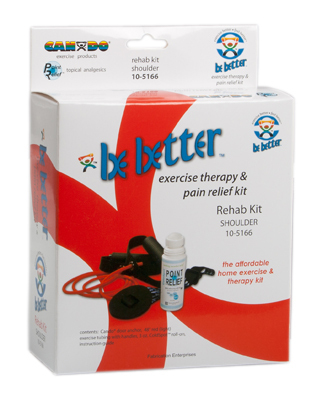 Be Better® kit combines CanDo® exercise products to increase strength, and ColdSpot™ pain relieving spray to increase comfort, along with an illustrated instruction pamphlet. Kit includes red light strength 4-foot CanDo® tubing with handles exerciser. CanDo® high quality latex resistive exercise tubing has been used in clinics for rehabilitation, conditioning and training since 1984. It has become a well known staple of many physical therapy programs. CanDo® exercise tubing is an economic solution for upper and lower body exercise. Lightweight, compact and portable. Durable. Effective when used alone, or with handles and anchors. CanDo® low powder exercise tubing and loops are made of natural rubber latex, which may cause allergic reactions. For those with latex sensitivities, there are latex-free alternative offerings of CanDo® exercise band. Kit also includes 15" red light CanDo® exercise loop. The loop is made of a continuous piece of high quality latex exercise band. Kit also includes door anchor accessory to facilitate exercise described in the pamphlet. Kit also includes 2 ounce spray bottle of ColdSpot™ topical analgesic spray. Point Relief® ColdSpot® topical analgesic spray offers fast-acting, soothing, temporary relief of minor aches and pains of muscles and joints associated with simple backache, arthritis, bruises, strains and sprains. Water-based formula minimizes grease and residue. All natural ingredients including menthol, MSM, ilex, and arnica. Has refreshing Peppermint scent. 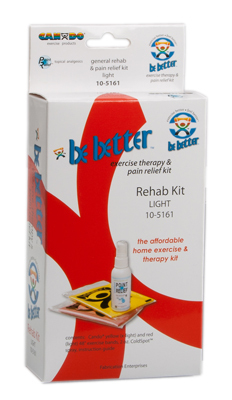 Be Better® knee and hip rehabilitation kit is perfect for home exercise programs and individual patient use. 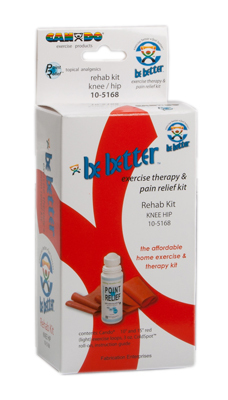 Be Better® kit combines CanDo® exercise products to increase strength, and ColdSpot™ pain relieving roll-on to increase comfort, along with an illustrated instruction pamphlet. Kit includes red light resistance, 10" long and 15" long exercise loops. 10" long loop is equivalent to 20" of flat band cut and tied in a knot, and 15" long loop is equivalent to 30" of flat band. Loop is 3" wide. Convenient pre-formed loop is made of high quality latex exercise band. Loops arrive ready-to-use, you do not have to cut and tie it before performing exercises! Kit also includes 3 ounce roll-on bottle of ColdSpot™ topical analgesic roll-on. Point Relief® ColdSpot® topical analgesic roll-on offers fast-acting, soothing, temporary relief of minor aches and pains of muscles and joints associated with simple backache, arthritis, bruises, strains and sprains. Water-based formula minimizes grease and residue. All natural ingredients including menthol, MSM, ilex, and arnica. Has refreshing Peppermint scent. Be Better® hand and wrist rehabilitation kit is perfect for home exercise programs and individual patient use. Be Better® kit combines CanDo® exercise products to increase strength, and ColdSpot™ pain relieving roll-on to increase comfort, along with an illustrated instruction pamphlet. Kit includes red light strength 4-foot CanDo® tubing with handles exerciser. CanDo® high quality latex resistive exercise tubing has been used in clinics for rehabilitation, conditioning and training since 1984. It has become a well known staple of many physical therapy programs. CanDo® exercise tubing is an economic solution for upper and lower body exercise. Lightweight, compact and portable. Durable. Effective when used alone, or with handles and anchors. CanDo® low powder exercise tubing is made of natural rubber latex, which may cause allergic reactions. For those with latex sensitivities, there are latex-free alternative offerings of CanDo® exercise tubing. Kit also includes door anchor accessory to facilitate tubing exercises described in the pamphlet. Kit also includes red light strength Twist-n-Bend® exercise bar. Kit also includes 3 ounce roll-on bottle of ColdSpot™ topical analgesic lotion. 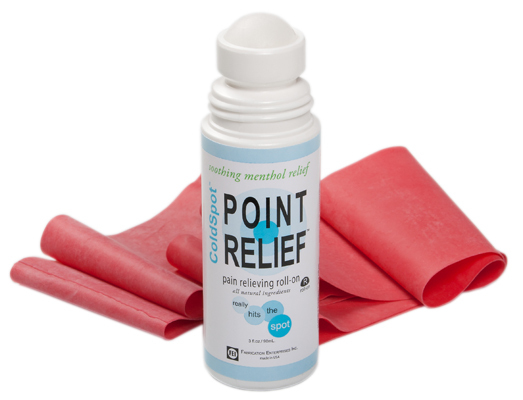 Point Relief® ColdSpot® topical analgesic roll-on offers fast-acting, soothing, temporary relief of minor aches and pains of muscles and joints associated with simple backache, arthritis, bruises, strains and sprains. Water-based formula minimizes grease and residue. All natural ingredients including menthol, MSM, ilex, and arnica. Has refreshing Peppermint scent. Dimensions: 12" x 3.75" x 3.75"